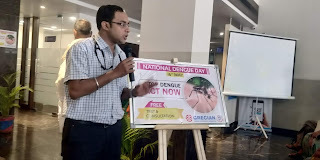 Chandigarh 16th May:- On National Dengue Day a Free Dengue Awareness /Investigation camp organised at Gracean Hospital in Mohali was inaugurated by the very first patient walked in for camp itself . 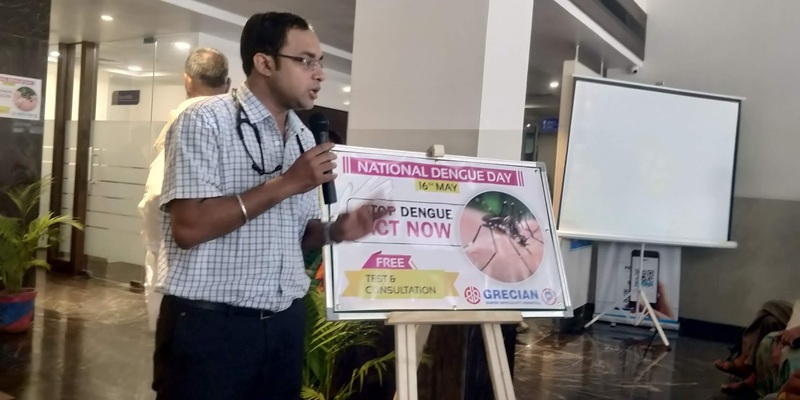 Addressing the citizens, Dr Kanish Bansal said that people need to be aware of possible mosquito-breeding spots in their vicinity and for that, Dengue awareness programme is very essential. There are chances of preventing the dreaded disease by making conscious efforts in maintaining a clean environment and preventing stagnation of water. On National Dengue Day already six case s have knocked tricity , it is our endeavour to bring about awareness campaigns to sensitise citizens of the harmful effects of dengue, caused by Aedes Aegypti mosquito, also known as morning mosquito. At the end of the address, he launched the Dengue awareness poster with general advisory for prevention of Dengue. A talk was also held to highlight the prevention of diseases like dengue from spreading. Dengue fever has been one of the major epidemic diseases registered in developing countries, causing great economic, social and public health impact to the communities where it occurs. Dr Shiv preet singh Samra MD of Gracean Hospital said that through this campaign, major emphasis was laid on preventing the stagnation of water that often becomes breeding grounds for mosquitoes carrying dengue, malaria and other diseases, 110 number of patients were screened and investigated for Dengue and everyone present took pledged to eradicate the dreaded disease.